You'll want to consider whether you can use cloth diapers at daycare if you plan to return to work after your little one is born. We provide tips to help you introduce cloth diapers and make cloth diapers successful. 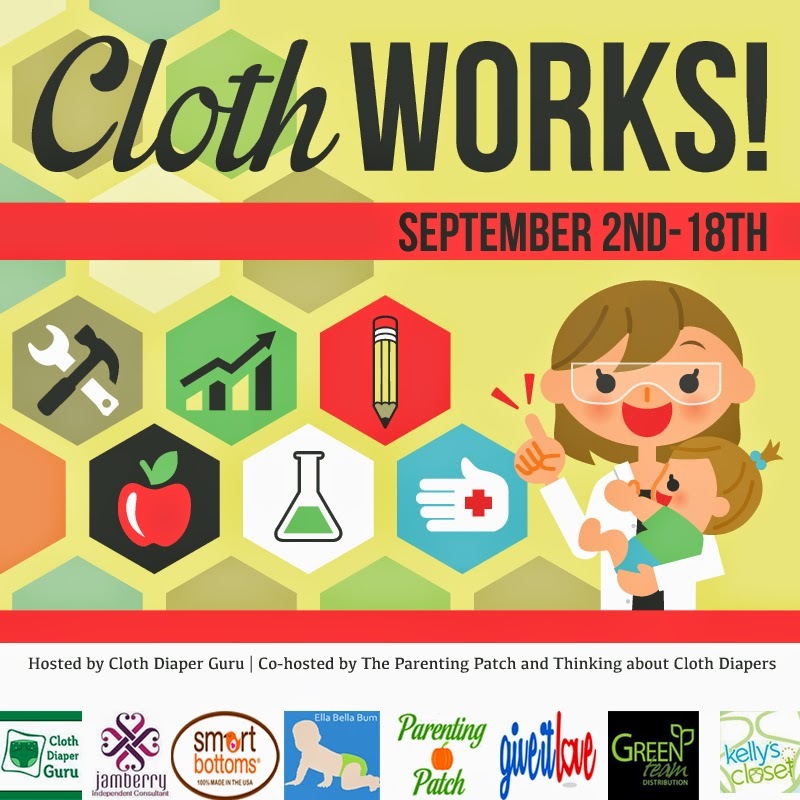 Welcome to the Cloth WORKS! giveaway. 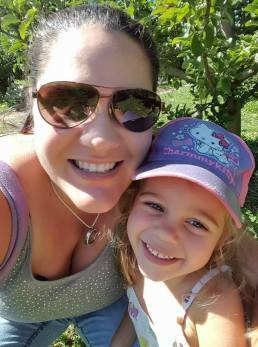 Nissa from Cloth Diaper Guru Blog is a working mom, and she is celebrating landing a new gig! If you're a busy parent, you know that Cloth WORKS! Not only do cloth diapers save money, they are also great for the environment. Read on for information on introducing cloth diapers to your daycare, check out our guest post on Cloth Diaper Guru for 10 Tips for Making Cloth Diapers Work for You at Daycare, and then scroll to the bottom to find out more about the prize pack and to enter the giveaway form! Using Cloth at Daycare: Why Not? Choosing the right daycare is usually a tough decision. There are a lot of fantastic daycare providers out there, but it can be tough to feel comfortable with someone you've just met, especially as you consider leaving your precious baby in their care! Your choice to use cloth diapers may be harder if you plan to return to work. While cloth diapers cost less in the long run, they require a large up-front investment. With the money saved from not purchasing disposable diapers, most cloth nappies pay for themselves in a couple of months. For moms who won't need to go back to work for a few months, or even a year, the investment in cloth diapers will still save you money. But for moms who plan to return to work sooner, you'll probably want to be sure that you can use your cloth diapers at daycare before you buy a complete set. When I went back to work, I was looking for a daycare provider that I would feel comfortable leaving my little boy with every day. And I wanted a stimulating environment where he would be safe and happy too. Added to this, since I had already bought them (and loved using them!) I hoped to use cloth diapers at daycare. Does Your Daycare Accept Cloth Diapers? While some forward-thinking daycare centers and home-based daycares already welcome cloth diapers, there are some providers that have policies not to accept cloth diapers at daycare. If your provider has a written policy, you may not be able to influence their decision. If you're willing to work at it, you may be able to help introduce change over time, but keep in mind that it can take a lot dedication to make a change. If you encounter resistance about cloth diapers at daycare because your provider is worried about daycare and government regulations, get educated! 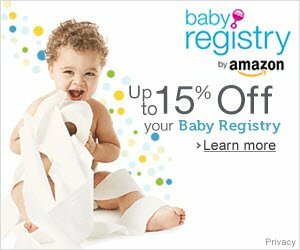 In the United States, the National Resource Center offers information on diaper regulations, so check out their resources if this is an issue for you. What about the providers that don't have a policy? 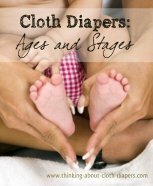 Think back to what you knew about cloth diapers before you got started. 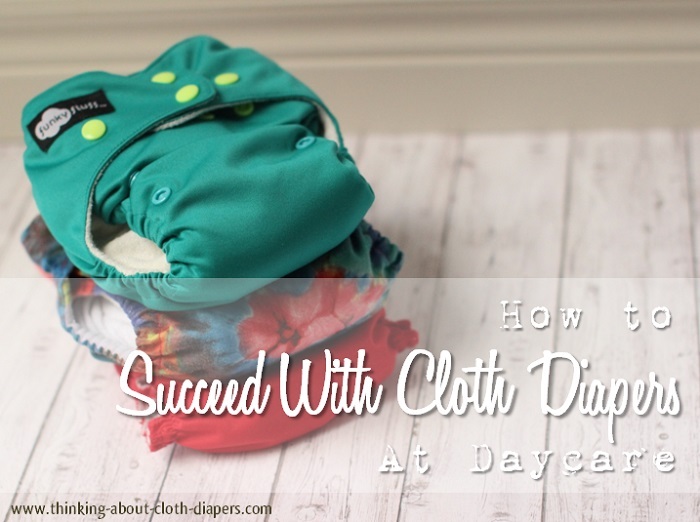 As you’ve probably discovered in the course of your cloth diapering experience, many people have had very little experience with modern cloth diapers - daycares included! If you want to use cloth diapers at nursery school, look for a provider that is willing to work with you. In most cases, you will be able to find an open-minded caregiver, especially if you take the time to share your own enthusiasm for cloth diapers with them! 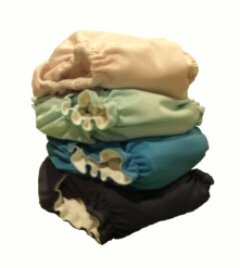 How can I Get My Provider to Use Cloth Diapers at Daycare? If your potential provider is unfamiliar with cloth diapers, convincing them to use cloth may be as simple as introducing them to the cloth diaper products you plan to use. As you demonstrate the product, take your time and wait for their questions and understanding. While you may have been using cloth diapers for months, this might be the first time your provider has been exposed to modern cloth diapers, so make sure to give them enough time to feel comfortable with the diapers. Keep positive and don't over-complicate it! Your provider may have preconceptions about using cloth diapers at daycare based on second-hand knowledge. Remember to encourage questions and feedback as you go, so that your nursery school or daycare provider can get comfortable with cloth diapers. If you’ve found a daycare you love but they’re not sure about cloth diapers, why not ask if they'll do a trial? You'll have a good chance of showing them how easy cloth diapering is if they are willing to test them out for a few weeks. Think about the long-term positive impact you can have! Though hesitant at first, after a couple of weeks of using cloth diapers, our daycare provider was just as happy with using cloth diapers on our child as she was using the disposables on the other children. A few months later, she accepted another child in cloth diapers without any hesitation. Often providers who have had good experiences with cloth diapers at daycare become much more comfortable with accepting cloth diapers from other parents, and many even become advocates for cloth diapers! It’s a great feeling to know you are making a long-term difference in others’ perceptions of cloth diapers! Demonstrate how to put them on. Go through an entire diaper change for them, showing them how to store the soiled ones and how to put the clean ones on. Make it easy for your daycare provider. 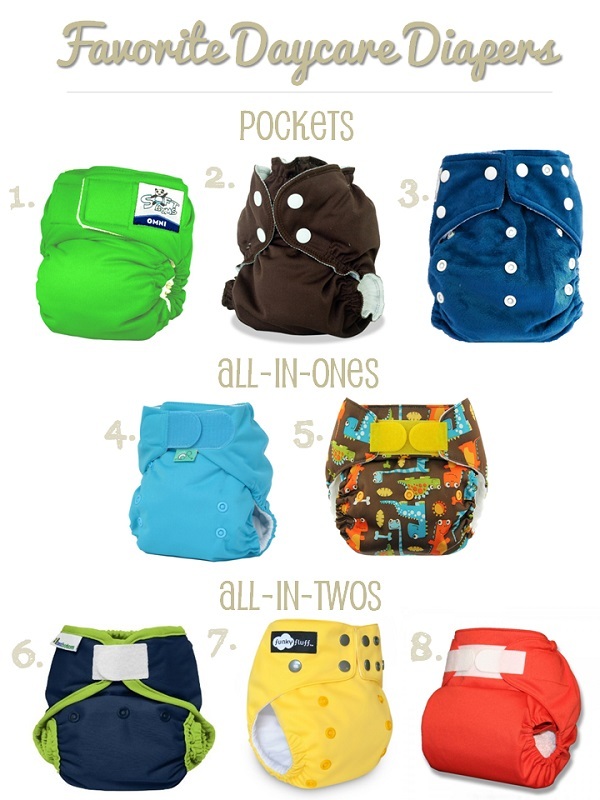 For those providers that are not used to using cloth diapers at daycare, you will likely have the most success if you choose a simple and reliable style, such as pockets or all in ones. Stick to one brand if you can! It always helps if new users don’t have to fiddle with various size settings and fits. Don't expect them to do more work than they would with disposables! When our son went to daycare, we simply sent cloth diapers and a wetbag. The only difference for our provider was that instead of wrapping the disposable in a plastic bag to put in her own trash can, our provider packed the cloth diaper into a wetbag for us to take home at the end of the day. It should go without saying: if you want to use cloth diapers, you should plan to do the dunk-and-flush routine yourself once you take your diapers home! Be on your best behavior – EVERY DAY! Make sure you’re sending clean diapers and a spare wetbag each and every day. Share your best attitude about cloth diapers. Remember, it is YOU that is doing the work of washing and folding them, so stay enthusiastic and focus on the bright side: less waste for them to throw out at the end of each day, just as quick and easy to put on, and a more eco-friendly diaper. Be accommodating. When our provider wanted us to provide disposable wipes we said, "Hey, no problem." I was happy to accommodate this request in exchange for her using cloth diapers at daycare! Ditto for if your provider asks for 2 wetbags instead of one. Be clear about using other products with your cloth diapers. It's a learning process, so keep educating your provider! The first few weeks my son was in his new daycare, he kept coming home with this white stuff in his diaper. It turned out she was adding talc (from her own supply) because she worried the wetness from the cloth diaper would cause a rash. Once I explained that the fleece in our pocket diaper acted as a barrier that kept moisture away from the skin, she quit worrying. Have a back-up plan. You might want to consider packing a couple of disposables at the bottom of the bag. There will undoubtedly be some evening that you forget to restock your diaper bag, or your child needs more than the regular number of diapers. Your provider will thank you for thinking of them. Mistakes do happen. My best advice is to forgive and forget! I can clearly remember the day my day care provider used rash cream with one of my pocket diapers. I was furious initially, but I cooled off as I scrubbed the cream out of the diaper. I worried the diaper would be ruined, but it wasn’t and it was a mistake that only happened once! Remember, it's very unlikely that your daycare provider is intentionally trying to ruin your cloth diapers, no matter how you might think of it at the time! We’ve built a great relationship with our provider, and ruining it wasn’t worth the cost of one diaper! Rather than complicate things, we asked if she could switch to disposables if a rash popped up partway through the day, and she was happy to accommodate. We rarely have to make the switch, so it’s not a big deal, but we both feel better knowing there is a simple alternative if it's needed. Depending on your provider, almost any brand of cloth diapers can work! If you're looking for ideas of brands that will work, below is a list of some of our favorite cloth diapers for daycare providers. Most come with hook and loop options (except where noted). While we love the ease of all-in-ones and pre-stuffed pocket diapers, we've found that all-in-twos with snaps at both ends of the insert can also work well. SoftBums Omni - we love the SoftBums system, but find the inserts in the Echo shift around a bit, making the Echo a little less friendly for daycare. We recently discovered the Omni, which can be used as an all-in-two with snap-in insert, or as a pocket when you tuck the insert inside the microfleece inner. With slide-to-size toggles to customize the leg sizing, we've found this diaper provides a good fit from birth to potty training. Stay-dry microfiber and bamboo inserts are available. Covers are $21.95 and inserts start at $4.95 from Nicki's Diapers. AppleCheeks Envelope System (available in snaps only) - use as a pocket for daycare (bonus that the inserts will agitate themselves out in the wash!) and as an all-in-two at home if you want to get more than one wear out of your covers. This system comes in two sizes, offering a nice snug and trim fit, and excellent longevity - we've had ours in our stash for 5+ years. Read our review here. Covers $19 and inserts from $4 each from Nicki's Diapers. Kawaii Snazzy Minky (available in snaps only) - an affordable and well-made pocket diaper featuring minky on the outside and microfleece on the inside. Comes with two microfiber inserts so you can double-stuff them for your heavy wetter. $9.75 from Lagoon Baby. Tots Bots All-in-One - we love the strong hook and loop on this little diaper. With a long snake insert that tucks into the diaper shell (similar to a pocket but all one piece) and an extra snap-in soaker, the v4 version from Tots Bots has the absorbency for heavy wetters, and all the ease of use of an all-in-one. $26.95 with free shipping from Diaper Safari. Blueberry Simplex All-in-One - this very absorbent all-in-one has a natural birdseye cotton inner with an attached stay-dry layer on the soaker. $28.95 each from Nicki's Diapers. Best Bottoms - a wipeable cover means that you might be able to get more than one use out of it before washing it. Plus, snaps at both ends and the option of stay-dry or thirsty hemp inserts make this a flexible system. Cover $16.95 and inserts from $3.95 from Nicki's Diapers. Funky Fluff Stay Dry (available in snaps only) - stuff this shell for a pocket, or snap the inserts at both ends for an all-in-two. The inserts tuck in deep at the front which will keep them from shifting. Read our full review here. $20.99 from Lagoon Baby. TushMate Cover - if you love the simplicity of flats or prefolds, you'll like the TushMate system. Buy their inserts, or combine with ones you already have (we love flats!). You can read our full review here. $16.58 for cover and stay-dry liner from TushMate. Sometimes it can take a bit more than a quick demonstration to convince your provider to use cloth diapers at daycare, especially if they've had a bad experience with reusable nappies in the past! If you think you might have challenge, read on for more tips you can use if you need to "sell" your nursery school or home provider on the concept. You may say, "I’m not a sales rep!" But don’t give up yet! You don’t have to be a sales professional to convince your daycare provider to use cloth diapers. While I’m not a sales person, I hope the "script" I've developed below will improve your chances for success in switching to cloth diapers at daycare. Keep in mind that most people are much more likely to listen to your "sales pitch" if they feel that you are speaking TO THEM. The easiest way to "sell" your cloth diapers to your provider is to address their needs. And the easiest way to address your daycare provider’s needs is to be sure you understand their motivations and concerns as they relate to cloth diapers, and even child care in general! If your provider has had a bad experience with cloth diapers at daycare, you will need to show you understand their concerns, and then help them understand how YOUR cloth diapers will be different. Be sure to take a cloth diaper and wetbag with you to your first meeting so you can show them exactly how easy your cloth diapers are to use. No matter what you’re “selling”, whether it’s cloth diapers or computer systems, you will be much more successful if you establish a connection with your customer than if you push your solutions on them before they are ready to listen to you. With this in mind, when you first ask your potential provider about using cloth, listen carefully to their response. You might be lucky to get someone who is completely open minded and has never had any exposure to cloth diapers. You can do a demo, and probably close the deal in short order! Or, you might get a daycare provider who has been in the business for awhile, and may even have had a bad experience with cloth diapers at daycare – leaking, poor fitting, or complicated to use. You will get much better results if you successfully manage your provider's resistance rather than trying to skirt around it. So ask your provider straight out if they've ever used cloth, and what their experiences with it have been. And if you hear some pushback, face it head on! Do this by asking questions to make sure you understand the provider’s concerns, and be sure to show that you do understand their perspective! If you ask questions, you might be able to discover that your potential provider agreed to use cloth diapers at daycare in the past but the other family thought she would rinse out all of the diapers and that took too much time away from her regular duties. Once you know this, you’ll be much more likely to establish a connection with your potential provider, because you can be empathetic and understanding. Before you move forward, acknowledge their feelings. Be sincere, but show you care. You could say something like "Wow, that seems really unfair! I can’t believe they expected you to do all the work." They’ll probably agree saying, "I know, and they were the ones who wanted to use cloth diapers, not me!" Now, keep digging! Ask a few more questions, just to be sure you understand their concerns about cloth diapers. Once you do, you can move forward with showing them your cloth diapers. For a provider that has complained that the diapers leak, you can say something like, "Cloth diapers have come a long way. Let me show you the type of diapers we use… see how they’ve been designed to fit just like a disposable? This elastic at the legs stops any leaks, and the material inside is hemp that absorbs baby’s pee. I can show you how easy they are to put on, you just snap them up like this. It took me a few tries to get used to doing up the snaps, but the great thing about snaps is that baby can’t get them undone like he tries to when we use a disposable. You just put the used diaper in this wet bag here, and zip it up, and that’s it, we’re done." Link your cloth diapers to their problems, and "sell" them on the "benefits" that really matter to your provider, rather than irrelevant features of the product. While I love my job, I dreaded the thought of returning to work at the end of my maternity leave. Finding the right daycare, a place where you will feel comfortable leaving your child every day and a place where your child will be safe and happy, can be a very stressful decision. Take your time - finding the perfect provider can take some time, but it's time well spent! Not every daycare provider will accept cloth diapers, but thanks to the efforts of parents like you, many providers are changing their mind about using cloth diapers at daycare! Nissa at Cloth Diaper Guru has got a brand new job, and she is inviting you to celebrate with her! Johnette's Jams: Two Jamberry Wrap Sheets and a Manicure Set ($42). You might think you don't have time to look fabulous, but every mom can have perfectly manicured nails, with Jamberry! These nail wraps stay on for two weeks (up to 6 weeks on toes) and they do not chip. Tip: host a party and receive free products! Ella Bella Bum: Custom Cloth Diaper ($30+) Do you want a one-of-a-kind cloth diaper that is impressively photo worthy? Sam from Ella Bella Bum has done it again with this gorgeous cloth diaper. Ella Bella Bum diapers are so sought after, you usually need to stalk their Facebook page to have the opportunity to purchase one. 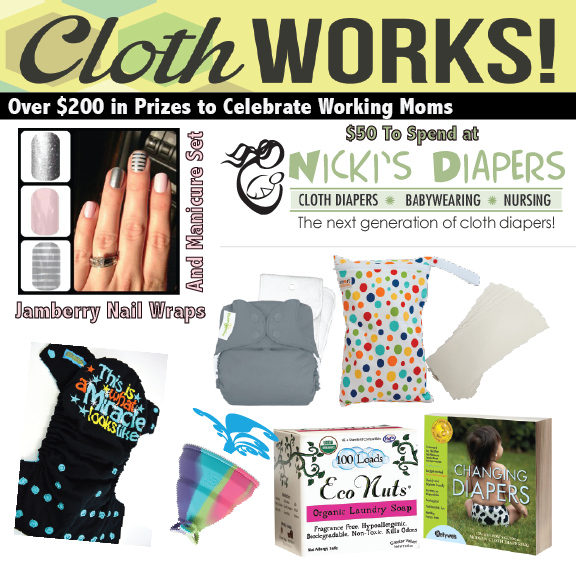 The Parenting Patch and Give it Love: $50 Gift Card to Nicki's Diapers. 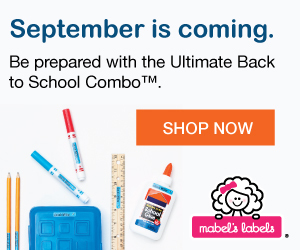 These websites are teaming up to give you the opportunity to have your own shopping spree at Nicki's Diapers. If you aren't already following The Parenting Patch and Give it Love on Facebook, you should head over and return the love. Green Team Distribution: EcoNuts, Diaper Dawgs Spray Collar, and Changing Diapers Book ($38) Cloth Diaper odors? Be gone! EcoNuts are a must-have for cloth diapers and clothing and Agnes recently fell in love with this new laundry solution (read her review). Make cloth diapering more fun and less messy with a Diaper Dawgs Spray collar. 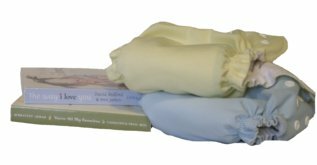 Smart Bottoms: Cloth Diaper Wet bag and Stay Dry Fleece Liners ($23) Keep your baby dry and comfortable with these fleece diaper liners, and store soiled diapers in style. Smart Bottoms diapers and accessories are made in the USA! You can never have enough cloth diapers! We excited to have the chance to give away a top-rated cloth diaper--especially one that worked well for our kids. Please note that falsified entries will be removed and entries from sweepers will be disqualified. Disclosure: I received no compensation for this publication. Thinking About Cloth Diapers and the other participating bloggers are not responsible for prize fulfillment. Sponsors are responsible for prize fulfillment. This giveaway is open to legal residents of the United States of America and Canada, and ends at 11:59 PM CST on September 18, 2014. One winner will be chosen at random. Winning entries will be verified. The winner will be contacted by email and must reply within 48 hours or another winner will be chosen. This giveaway is not affiliated with Facebook, Twitter, Pinterest, Instagram, or any other method of social media. Sponsors and Cloth Diaper Guru blog reserve the right to substitute a prize of equal or greater value if the winner is from Canada or if the original prize becomes unavailable. Kelly's Closet selects the solid color cloth diaper to provide (winner may select gender).